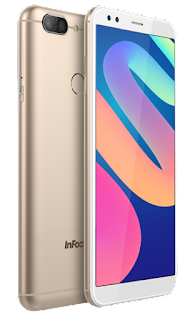 InFocus has launched InFocus M7s in Taiwan.It comes with 5.7-inch HD+ IPS On-Cell display and has a screen-to-body ratio of 82.3 percent powered by a 1.3GHz quad-core MediaTek MT6737H processor. It has a 3GB of RAM and 32GB of storage, which can be further expanded up to 128GB using a microSD card. On Camera, it has a 13-megapixel + 8-megapixel module on the rear panel and an 8-megapixel shooter with f/2.2 aperture and beauty mode. There is also a PIP mode called ‘Dualfie’, which captures an image from both the front and rear camera. The device runs Smile UX based on Android Nougat Packed with a 4,000mAh battery. InFocus M7s comes in Platinum Light Gold and Obsidian Black colours in Taiwan. InFocus has priced at TWD 4,290.